Mumbai's suburban railway network may earn some brownie points in its efforts to overhaul the system to make it energy-efficient and travel-friendly. New braking and duct systems have been introduced in some coaches. But grey areas remain. "Every year we buy power worth Rs 300 crore to run the suburban railways. Late last year, we introduced new trains with regenerative braking system. It involves a machine that supplies electrical energy back to the overhead power lines, used by other trains in the same service line. We estimate 35 per cent of energy will be saved," says P C Sehgal, managing director, Mumbai Railway Vikas Corporation Ltd (mrvc). The energy saving will get translated to saving Rs 100 crore annually--250 million less units of energy produced (one unit costs Rs 4 approximately). "Our project will save almost 0.25 million tonnes of co2," Sehgal says. mrvc is the nodal agency implementing railway projects in Greater Mumbai under the Mumbai Urban Transport Project, funded by the centre, the state government and the World Bank. mrvc has also become the first railway agency to submit a project idea note to the clean development mechanism executive board at Bonn in Germany, demanding issuance of certified emission reductions. The corporation is now waiting for the verification process to complete so that certified emission reductions are granted and can be traded. 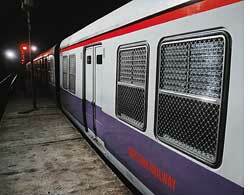 Problem areas Mumbai suburban railway is spread over 319 km and has the highest passenger density in the world. About 6.3 million commuters use the services every day. Local train, called emu (electric multiple unit), should ideally carry about 1,800 passengers in its nine coaches, also called rakes. But it carries about 4,500 passengers at present. High passenger load means very high levels of co2 within the coaches. Studies conducted by mrvc have indicated that co2 levels in emus were as high as 2,450 parts per million (ppm), with the outdoor concentration (in air) being 850-900 ppm. The indoor concentration should be less than 700 ppm of outdoor air concentration, stipulates the American Society of Heating, Refrigerating and Air-Conditioning Engineers Inc standards 62-2001. To deal with the problem, mrvc has introduced the duct system. "During super dense crush load condition, 570 passengers travel in a coach, and that generates 10 cubic metre per hour (m3/hr) of co2. Fresh air requirement calculations indicated at least 15,000 m3 /hr of fresh air needs to be supplied. The new system cost us Rs 4 lakh per coach but it has significantly improved the travel experience of commuters," says Sehgal. mrvc has introduced three such emus and is planning two more. Studies carried out after introduction of duct systems showed that there was a reduction of 1,000 ppm of co2 levels from the existing highest level of 2,450 ppm. "In new ac/dc emu rakes the co2 level ranges between 700 and 1,450 ppm when ambient co2 levels are between 680 and 800 ppm," reads the report of a study titled 'Ventilation system for new technology dc/ac emu procured by mrvc'. But the problem of high passenger load remains. The pace at which railway projects in Mumbai are increasing is slow, says Sehgal. The feasibility study for emus with 12 coaches was carried out in 1974 but Mumbai continues to have trains with nine rakes. Under the Mumbai Urban Transport Project, 12-rake trains are being introduced but it won't be until 2012-13 that all trains will have 12 rakes, which will bring down the peak passenger load to 3,600. Transportation experts are critical about the manner the state government is pushing road projects--sea links, flyovers--opposed to mass transit system. In 2006, the government had approved a plan to build 15 flyovers in the city. According to Stuart Cole, director of Wales Transport Research Centre, mass transit in Mumbai can be achieved through tracks, which need to be upgraded immediately (see 'Interview', Down To Earth, February 29, 2008). Then there is the pass-the-buck game between the centre and the state. "We (mrvc) come under the central railway ministry; transportation planning is done at the state level. We come into the picture only when the state government shows some interest in railway projects. But that is not the case," says Sehgal.